'']] Maude Barbara (Egli) Swartzendruber: nurse and educator; born 8 October 1903 to Christian B. Egli (22 November 1874-22 April 1959) and Emma Grimm Egli (2 April 1877-26 June 1934) at Hopedale, [[Illinois (USA)|Illinois]]. She was the fifth child and oldest daughter in a family of 13 children. On 3 March 1927 she married John Swartzendruber (15 December 1899-10 December 1928). They had no children. At the time of their marriage John was working for a grain dealer in Weiston, Iowa. He died of complications shortly after surgery for acute appendicitis. Ironically her mother died in 1934 of a ruptured appendix. Maude Swartzendruber died 26 November 1990 in Kalona, Iowa. "Maude E. Swartzendruber." <em>Mennonite Weekly Review</em> (31 January 1991): 11. Maude Swartzendruber, 1934. Nightingale Yearbook photo. 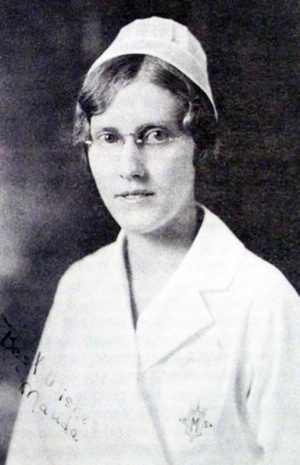 Her interest in the training of Christian nurses led Maude Swartzendruber back to La Junta in the fall of 1937 where she taught nursing sciences for one year. The next five years she taught and supervised in the surgical nursing division of the hospital. She then became Director of the Mennonite School of Nursing and the Nursing Service at the Sanitarium in La Junta, Colorado, from 1943 to 1956. For five of those years she served on the Colorado State Board of Nursing. From 1957-1963 she served as Director of Education at the Mennonite Hospital of Nursing in Bloomington, Illinois. From 1963-1966 she was established the department of nursing and was Director of Nursing at the new Huerfano County Medical Center in Walsenburg, Colorado. She served as college nurse at Hesston College from 1967-1972. Goertz, Adalbert. "Swartzendruber, Maude Barbara Egli (1903-1990)." Global Anabaptist Mennonite Encyclopedia Online. March 2010. Web. 19 Apr 2019. http://gameo.org/index.php?title=Swartzendruber,_Maude_Barbara_Egli_(1903-1990)&oldid=96676. Goertz, Adalbert. (March 2010). Swartzendruber, Maude Barbara Egli (1903-1990). Global Anabaptist Mennonite Encyclopedia Online. Retrieved 19 April 2019, from http://gameo.org/index.php?title=Swartzendruber,_Maude_Barbara_Egli_(1903-1990)&oldid=96676.